Improve cooling and airflow of your case/system with this silent Apevia 120mm white LED fan. 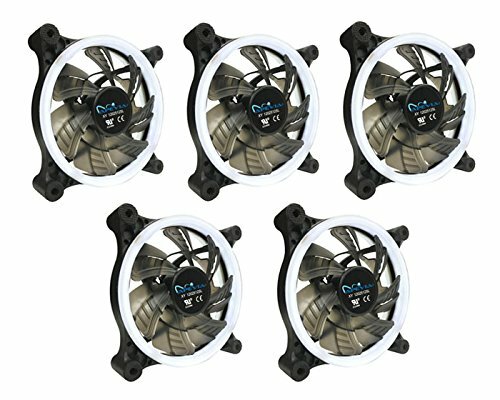 With 7 black blades and 32 white led lights, it produces better cooling performance and brings out the most magnificent white lights to this fan. Anti-vibration rubber pads on all four corners keep the fan super silent. It offers incredible cooling to increase the longevity and stability of the system and components; meanwhile, adds glamour and character to your PC. 120mm x 120mm x 25mm. Comes with 4pin+3pin Connectors for connecting to Power Supply (4pin) or Motherboard (3pin). Fan Speed: 1350 ± 10% RPM. Air Flow: 57.67 CFM. Air Power: 12 VDC. Low Noise Level: 24.7 dBA. Life Expectancy: 25,000 Hour. Case Screws are Included. 5 Color Options: Blue, Green, Red, Pink & White. We also have single pack, 2-in-1 pack and 3-in-1 pack available. If you have any questions about this product by Apevia, contact us by completing and submitting the form below. If you are looking for a specif part number, please include it with your message.